On June 21, 2018, my life…my world shifted. My mother passed away quietly in her sleep late in the evening of July 20th and was declared dead in the wee hours of July 21st. I will never forget the sound of her last breath. I will never forget the sight of her dead body being carried out of the house. After seven years of caring for her and watching Lewy Body Dementia ravage her body and her mind, my heart was stunned by the reality that she had died right before my eyes. I’m still grieving the loss of her presence in my daily life. Being my mother’s caregiver is how I have defined myself for the last 7 years. Now I’m not just a motherless child, I am a parentless child…an orphan of sorts and I don’t like this role. When my father died very suddenly in 1995, I was also stunned…as was the rest of the world. Mom was still with us. She marshaled us through some dark days. She carried us through learning how to live without Dad. It appears that it is now the job of each member of my family to figure out how to live without our matriarch and patriarch. We will come through this stronger, wiser, and equipped to help others. God is with us and on our side. I have a lot to figure out. I must move forward. Life will go on. Life MUST go on. LET’S GO! Never Give Up. God Is With You. It’s been a rough 72 hours. For me writing is therapeutic and allows me to step back and examine circumstances in a way that often leads me to answers and makes me get out of the way and let God be God. The most exhausting days are the ones where I must combat an issue that I don’t understand and seems to have no answer. The process looks something like this when I am dealing with an issue re. my mother’s health and wellbeing. For me prayer is not a last step, but a first and a continuous one. Talking with nurses and doctors who have no answers is frustrating. Searching the internet and finding 309,497,832,754 different solutions that make no sense or are inapplicable to someone in Mom’s condition is frustrating. Getting no sleep overnight night after night is exhausting. It is at these times that I think of the millions of caregivers who are going through similar experiences who feel alone, abandoned, isolated, and hopeless and then I feel God’s presence most. I become thankful for my circle. My understanding deepens of Dad repeatedly saying, “I am alive and grateful” and Mom repeatedly saying, “We’ll see what the Lord will do”. I am filled with gratitude in the midst of the situation and reminded that God is bigger than anything I experience. That alone is enough to keep me going. I pray that God fills my fellow caregivers with wisdom, strength, support, the right people, the right information, and boldness to address whatever the day brings. I say this pray for all of us. 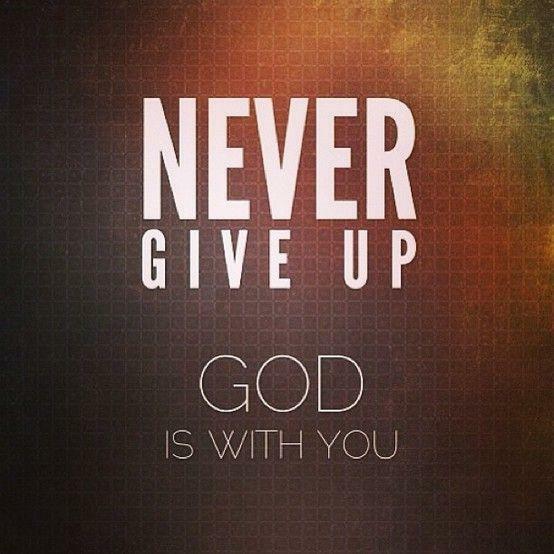 God is with us and we must never give up. I usually follow this up with journaling in some form and then evaluating what I have written and searching for an insight that gives me what I need to move forward. Some circumstances require that I go through this cycle repeatedly and that’s OK. The thing that often plays over and over in my head throughout this process, Never Give Up. God is with me. As a caregiver, this is fundamental to my ability to keep going when I’m exhausted, overwhelmed, scared, confused, or whatever…and there are a lot of “whatever” moments! NEVER GIVE UP. GOD IS WITH YOU! I pray that this also helps someone get through whatever life is throwing at them. Sidenote: As I write this, my mother has had a much needed break from coughing and is sleeping. YAY!!! I celebrate my mother and honor her for all she has instilled in me. Mothers and daughters often go through rough years and we certainly did. Here we are at this stage of life where I get to care for her, love her, protect her, and guide her to her next phase of her journey. 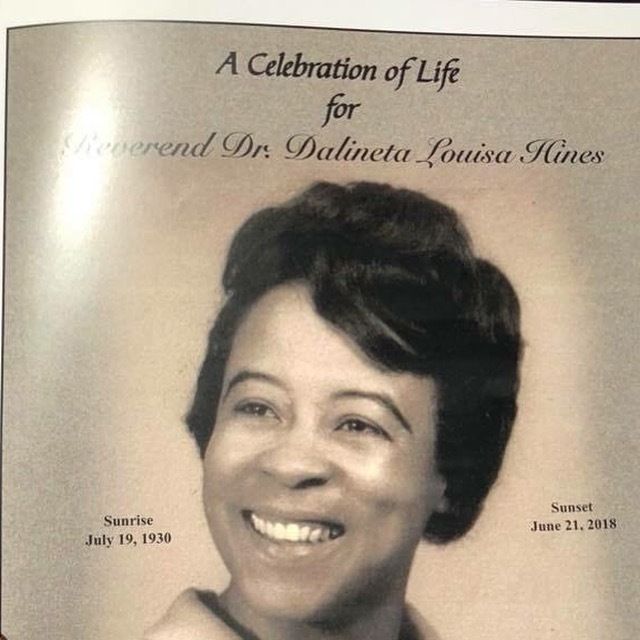 I am the daughter of Reverend Dr, Dalineta Hines. I am blessed to have been loved, nurtured and shaped by this incredible woman. Alzheimer’s has impacted her body, her mind, her life and our roles in each other’s lives. It has also given me the opportunity to love and experience my mother in new ways. I’m grateful that she gave me life. I am also honored that she made that life an incredible life. 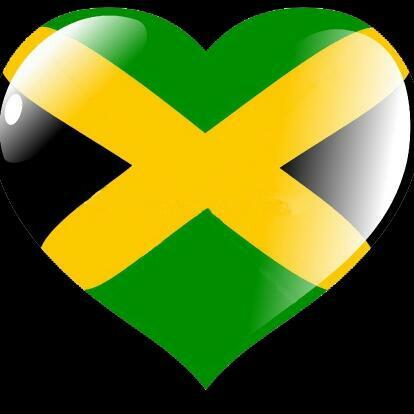 I will always love and treasure my mother! My mother taught me to know, love, pursue and serve God. There is not a single aspect of my mother’s life and living that was not based on her spiritual foundation. Hospital administrator, wife, mother, friend, leader, team member, ministry partner, church member, teacher, advisor, mentor, student, and every other way Mom has shown up in the world has been built on her strong spiritual foundation. Mom and Dad started every day with reading Oswald Chambers’ “My Utmost for His Highest” and praying together…every single day. They ended every day with prayer. She never faces an issue alone, God is always with her. When singing around the house, she would sing hymns and spiritual songs. When celebrating accomplishments, God is glorified. When facing trials and tribulations, God is called upon to strengthen and make a way. God and holiness are simply the air she breathes. Now that Alzheimer’s is ravaging her brain, God is still at the forefront. Her caregiver reads the bible with her and sings hymns with her. Late at night when Mom and I have our alone time, we sing hymns and spiritual songs, and I read My Utmost for His Highest to her. These are the things that bring her peace and joy. From the day I was born until this day, my mother has lived a life that makes God look good. I want to know God because of the way my mother lived and lives her life publicly and privately. I want to know the God that has come through for her time and time again. I want to know the God that is still with Mom know as she is on this journey through Alzheimer’s. I want to serve the God that fascinated me as mom read bible stories to me as a child. This Living God that permeated and still permeates every aspect of Mom’s life is the one I now pursue, love, serve, and take time to get to know deeper and more intimately. I am blessed to be my mother’s child and a child of God. I thank God for my mother and the life she has lived! My mother taught me to appreciate art, culture, traveling and etiquette. My mother made time for trips to museums, concerts, art exhibits, the theater, etc. She made sure that all of her children took piano lessons and whatever other instruments grabbed our attention. We were all in choirs at school and church. My brothers were boy scouts. My sister and I had bad allergies and that got us out of girl scouts pretty quickly. Dining out was always an adventure. Knowing how to pronounce everything on the menu was important. Knowing when to use each utensil, glass, plate, bowl, etc. was also important. Sitting properly, walking properly (I can still feel her knuckle running down my spine when I realize that I am slouching), speaking properly, dressing appropriately, being informed about world affairs, local politics, sports, and issues negatively impacting our community, knowing at least one language other than English (the Queen’s english vs American english is a topic for another day) all of these things were part of growing up in the Hines household. Mom made reading an adventure. Trips to the library were like trips to a fantasy land. I remember escaping into the world of whatever book I was reading. Reading with my mother was the BEST. She made every word pop off of the page. I could see the words not just hear them. We didn’t just use our imaginations to travel, we got in our car, a plane, a train, whatever it took to get around. My parents travelled extensively and made sure that we knew that the world was much bigger than our neighborhood. There was always something to see, learn, and experience. She consistently found ways to expand our knowledge and experience of the world and its people. I am very grateful for that. 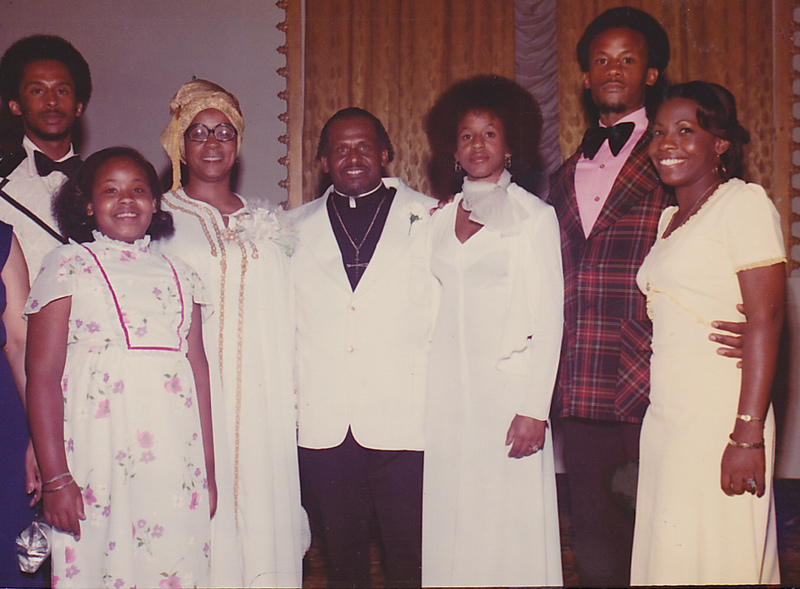 Mom and Dad with Uncle Louis and Aunt Cokie Evans.